What will it take to restore the primacy of primary care? It has been evident for some time now that primary care is in trouble—deep trouble. Fewer medical students and young physicians choose to go into family medicine, general internal medicine and pediatrics, with just 19% of third-year medical students likely to opt for primary care, according to an American Association of Medical Colleges survey. Surveys also show that many established primary care physicians have left the field. An even larger number of general internists, family physicians and pediatricians are within five to 10 years of retirement. Who will take care of their patients—and the millions more who will be seeking health care as the population ages—if something isn't done soon to make primary care an attractive career path for young physicians? On an almost daily basis, ACP hears from internists who are frustrated by the challenge of trying to spend more time with patients when the economics of practice demand that they rush patients like widgets on an assembly line. They tell about the difficulty in keeping practices afloat as the costs of delivering services continue to increase while reimbursement stagnates or even declines. They want to know if ACP understands their plight and what we are doing to make things better. Under the direction of the College's regents and governors, ACP has been a strong advocate for policies to restore primary care. In January 2006, the College warned policymakers that primary care was heading toward collapse. We proposed new ways to pay general internists and other primary care physicians for the work associated with care coordination, particularly for the time spent outside of a face-to-face visit. 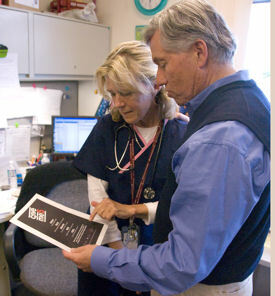 ACP joined with others to achieve, in January 2007, the single largest increase in Medicare payments for office visits since the program was created in 1965. We proposed reforms to reduce student debt for physicians who go into primary care. Our ideas were included in the High Need Physician Workforce Act, introduced last year in the House of Representatives by Rep. Michael Burgess (R-TX). We have joined with our colleagues in family practice, pediatrics and osteopathic medicine to propose the patient-centered medical home, a model for improving health care that is organized around the relationship between primary care physicians and their patients, supported by a better payment system. We authored a policy paper calling for a new national workforce policy to set an explicit goal for increasing the number and proportion of internists trained in primary care. Most recently, the College compared the U.S. health care system with those in other industrialized countries. We found that countries with more primary care physicians consistently have better care at much lower cost than America. Based on this finding, we proposed that candidates running for Congress commit to a candidate's pledge to provide every person with access to a primary care physician by creating workforce and payment policies to increase the numbers of primary care physicians, recognize the value of primary care, and support care organized through a patient-centered medical home. Skeptics may wonder, though, if anyone is listening. On this score, the College has made enormous progress. We co-founded the Patient-Centered Primary Care Collaborative, a coalition of employers, physicians, health plans, and consumers to advocate for primary care and the patient-centered medical home. The coalition now includes almost 100 Fortune 500 companies, consumer groups and physician organizations working together to implement models to improve payments for primary care and to implement the patient-centered medical home. And most recently, the Medicare Payment Advisory Commission, a congressionally chartered group of experts that advises lawmakers on payment policies, gave preliminary approval to a recommendation to provide an across-the-board increase in payments to primary care physicians. Why are so many now joining in the fight to restore primary care? Because they believe, based on a growing body of evidence, it is the key to improving quality and lowering cost. A study published in the Feb. 5 American Journal of Medicine found that each 1% increase in the proportion of primary care physicians in average sized metropolitan areas resulted in decreased yearly utilization of 503 hospital admissions, 2,968 emergency room visits and 512 surgeries. Congress, employers and consumers are working toward ways to improve quality and reduce costs. ACP is seeking ways to improve the economic environment for internists in primary care. Because we have joined together with those who buy and receive health care, and because we now have the evidence needed to make our case, we are on the verge of transforming health care policy to support and restore the value of primary care. But we still have a way to go to show our beleaguered members that progress in the advocacy arena will translate into tangible improvements in their own practices.